The Perth Mint has started accepting orders for the 2015 Chinese Ancient Mythical Creatures High Relief 5oz Silver Proof Coin. The coin features dramatic depictions of the blue dragon, white tiger, red phoenix, and black tortoise. According to ancient Chinese mythology, the universe was divided into four quadrants marking the beginning and end of the winter and summer solstices, and the autumn and spring equinoxes. These heavenly quadrants were known as the “Four Celestial Palaces”, with each palace represented by a guardian animal with a corresponding color, element, and virtue. The reverse design of of the coin portrays the four Chinese ancient mythical creatures, the blue dragon, white tiger, red phoenix, and black tortoise with a yinyang symbol in the center of the coin. The design includes the inscription CHINESE ANCIENT MYTHICAL CREATURES. The obverse contains the Ian Rank-Broadley effigy of Queen Elizabeth II along with the 2015-date and monetary denomination. The coins are issued as legal tender under the authority of the government of Tuvalu. Both the obverse and reverse of the coin are minted in high relief on concave surfaces to ensure the optimum flow of metal is achieved by the strike of the die. Each coin is struck from 5oz of 99.9% pure silver in proof quality. The diameter is 50.60 mm and the maximum thickness is 12.50 mm. 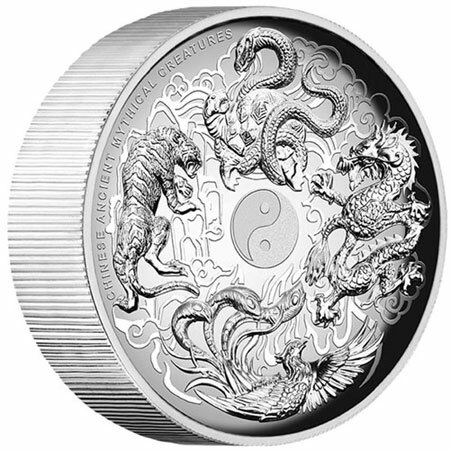 No more than 1,000 of the 2015 Chinese Ancient Mythical Creatures High Relief 5oz Silver Proof Coin will be released. Coins are presented in a classic black box within a superbly illustrated shipper, and are accompanied by a numbered Certificate of Authenticity. For additional information or to place an order, please visit the Perth Mint product page.